Brown dressed rim of a mid 18th century Chinese export porcelain plate. From around the 1630s a brown wash was regularly applied to strengthen the rims, thin out the fragile glaze and maybe sometimes to imitate a silver or copper band. Historically it is a defining feature of the Shunzhi period (1644-61) porcelain. In rare occasions it can also be found on Song to Yuan dynasty Qingbai bowls and dishes, probably in imitation of the metal lining used to cover the rough rims of porcelain fired face down (fushao), resting on their unglazed rims. 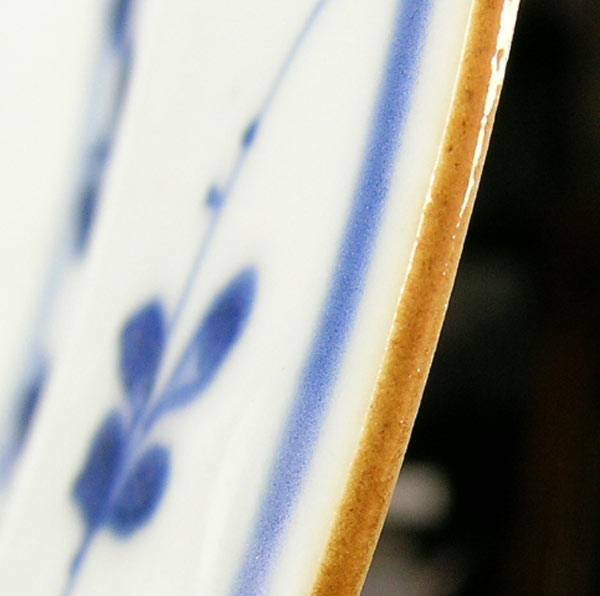 Traditional thinking is that brown rims was introduced to come to term with a tendency for the rims of the Late Ming porcelain to develop blisters and the glaze breaking off at the rims (called "mouse nibble" in Japanese). Some have suggested that the brown rim was added in imitation of the Dutch Delft faience (tin glazed pottery), but I am not so sure in which direction that idea moved if indeed at all. The Shunzhi emperor was the first Qing emperor to rule over the whole of China and it was historically a troubled time with a lot of illicit contacts with western foreigners and Japanese that might have had an impact. Other than that I am not aware of any political or artistic reason for this brown rim of the time, but, we know that the paste was usually rough and the decorations often crowded, maybe to hide the impure paste. The glaze used for this was the most simple possible and the same as used for the "batavia" browns. The base was "yellow earth" according to information given in the first of Pere the Entrecolle's letters from Jingdezhen in 1712, or in other words, mud. Depending on iron content or other impurities - your guess - the colors turned out different over the years and actually within the batches of similar porcelain. Still we can find an average preference depending on maybe fashion, causing a larger percentage of the porcelains turning out in different shades. The brown rims continues to become quite common during the first half of the 18th century but there does not seem to be any rule to it. Some have, some don't. Sometimes there is a touch of gilt added to the brown rim, which gives it a more metallic sheen as if the rim was actually clad in a bronze colored metal rim. During the Kangxi period a light beige color was most common, during the early Qianlong period a full chocolate ("High Batavia") brown was most common and for a short period in-between, around Yongzheng a dark coffee brown was the preferred shade. See for examples the cups and saucers with this brown coming out from the Ca Mau find. A direct comparison can be made with the shade of the surface covering so called Batavia wares. This is all traditional thinking about this feature. Beside this, I am not aware of any research or original documents from the time that addresses this feature.